FedEx is the second-largest package delivery company in North America after the United Parcel Service (UPS). FedEx is also second in the size of their commercial fleet. You might not expect to hear this from truck accident lawyers but FedEx is a good company that largely does thing the right way. They are hustling to give its drivers and the rest of safe. Although FedEx does not require prior commercial driving experience, applicants who apply to FedEx are thoroughly screened with background checks and strength test. Sure, the company makes mistakes in their selection of driver and contractors and there are lawsuit alleging that those mistake causes harm. But most accident settlements and lawsuit involving FedEx are a byproduct of the sheer volume of its fleet that has more than 20,000 motor vehicles and over a quarter of a million employees. Federal Express has a big chunk of nation's transportation system moves 18 billion tons of goods worth over $19.2 trillion. There are bound to be a lot of motor vehicle accidents. Frequent accidents also inherently co-travel with the model that delivering faster is better than delivering slow. FedEx has tried mightily to reduce the harms that come from this model. But there is only so much a freight and delivery company can do. Most car and truck accident cases do not involve a significant liability dispute. The battlefield is over determining the settlement value of the injuries. Cases against FedEx are going to have a higher settlement value against than your typical car accident case involving the exact same injuries? Why? 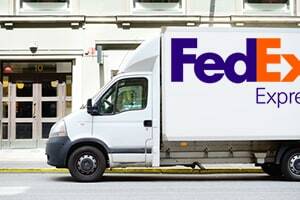 The reason a case against FedEx has a higher settlement value is that a jury fully understands that FedEx has plenty of money to pay off a verdict. In Maryland and in most states, the jury is not told that the defendant has car insurance. Usually someone in the jury figures out that the defendant must have insurance and spills the beans to the rest of the jury. But it still has a chilling effect on the compensation number the jury reaches. We have had cases where the juror's first question after the trial was whether the nice defendant will have to pay any of the big verdict they just awarded. The jury often also feels sympathy for the driver and does not want to hit them with a large verdict. Often, when suing FedEx and other big companies, we will not even name the driver as a defendant. This allows the jury to focus exclusively on the big pocket. The other big difference about a lawsuit with FedEx is that if there is a liability dispute, there are a host of weapons you have to investigate whether FedEx was at fault for the collision. FedEx vehicles are loaded with all of the latest technology and have an electronic mobile communication (EMC or black box) device which can give you vital information on the vehicle during the crash. This information includes speed, the braking system, the vehicle's mechanical system, and a host of other pieces of information that an accident reconstructionist can use to retrace the vehicle's steps. There is also important information available about a driver's compliance with hours-of-service regulations. There is just a wealth of information if your accident lawyer knows where to look. But the idea that any car accident lawyer can find their way through this maze is just plain wrong. Our website has a lot of weapons to help you better understand the settlement value of your case. You can look at the settlement value for the type of accident or, better, the type of injury. For many of these, we have statistics for the average and mean trial or settlement value of these kinds of cases. Another limited but helpful tool is examples of settlement and verdicts involving the defendant. In very general and limited terms, it gives you an idea of how the value of these case vary with the severity of the injuries and the economic loss caused by the injuries or death. 2016, New Mexico: $5,425,000 Verdict. The plaintiff is decedent's spouse. A 48-year-old man is a co-driver in a FedEx truck. The defendant FedEx driver allegedly falls asleep behind the wheel. The truck rear ends another tractor trailer causing the passenger to be ejected from the FedEx truck. Unfortunately, the passenger passes away from the result of the collision. Plaintiff brings a wrongful death suit contending that the collision is a result of the negligence of the Federal Express driver falling asleep behind the wheel. A jury awards the plaintiff $5,425,000 damages. The gross damages were $7,300,000. The jury found 25% liability in the other tractor trailer. 2015, Alabama: $4,000 Settlement. Plaintiffs file a negligence claim on behalf of their minor grandchild. The minor is a passenger in a vehicle that is struck by a FedEx tractor-trailer. The minor is diagnosed with bilateral back pain. The claim is settled for $4,000. Obviously, the injuries were probably not particularly serious. 2014, California: $7,500,000 Verdict. A 22-year-old female is riding her bicycle when she is struck and killed by a FedEx delivery truck. FedEx admitted liability and the jury trial proceeds to determine the amount of non-economic damages. The plaintiff states that she had a unique and extraordinary relationship with her daughter and therefore should receive non-economic damages loss of her daughter's love, companionship, comfort, care, assistance, protection, affection, society, and moral support. The jury award the plaintiff $2,500,000 for past pain and suffering $5,000,000 for future pain and suffering for the loss of her child. 2013, California: $125,000 Settlement. Plaintiff is driving his vehicle on the highway when he is cut off by a FedEx delivery truck that collided on the right, front corner of his vehicle. Plaintiff's vehicle runs off the road and the driver suffers injuries to his neck, lower back, and left hip. After the accident, the plaintiff visits a chiropractor and is diagnosed with a lumbar disc herniation at the L4-L5 level, bursitis of the left hip, and a soft-tissue strain of his neck. The plaintiff receives four months of chiropractic care and several epidural injections of his left hip and lower back. Plaintiff had $59,000 in past medical costs. The parties negotiated and agreed to a $125,000 settlement. 2012, Texas: $2,160,000 Verdict. Plaintiff is a woman who is driving on a highway when defendant truck skids across several lanes of traffic due to wet conditions and collides with Plaintiff's vehicle. Plaintiff suffers a multitude of injuries including a ruptured spleen, a compound fracture to the femur, substantial damage to her knee, a closed head injury, rib fractures, transverse process fracture, herniation at L4-5, and lacerations to her face, head, arms, and body. Plaintiff is transported to the hospital where the femur fracture is repaired and her spleen was removed. She had to undergo multiple surgeries on her left femur and had to undergo knee replacement and back surgery. The jury awarded the plaintiff $2,160,000 included $300,000 for physical pain and mental anguish and over $900,000 for future medical expenses. 2010, North Carolina: $1,975,000 Verdict. Plaintiff is a 69-year-old that was driving her 88-year-old mother on the highway when FedEx delivery truck crossed the center line and collided into the plaintiff's vehicle. The plaintiff's mother dies while being transported to the hospital and the plaintiff suffers a broken left femur and knee and a crushed right ankle and foot. The jury awarded the plaintiff $1,975,000 after deliberating for two hours. 2008, Florida: $653,139 Verdict. Plaintiff is a 33-year-old male. The man merges back on the highway from the shoulder when he is rear-ended by defendant FedEx truck. Plaintiff responds to the hospital and is diagnosed with disc herniations at T8-9 and L5-S1. The man is required to receive three injections for the lumbar herniations. At the trial, the defense argues that the man did not properly signal when returning to the highway and therefore the FedEx truck did not see him. The jury awards the plaintiff $78,139 in past medical costs, $300,000 in future medical costs, $75,000 in past pain and suffering, and $200,000 in future pain and suffering. Our law firm is based in Maryland and most of the cases we handle are in the Baltimore-Washington area. But we handle significant injury cases throughout the entire country. If you have been harmed in an accident with a FedEx truck and want to consider a lawsuit or a claim for an out-of-court settlement, call one of our lawyers at 800-553-8082 or click here for a free no obligation Internet consultation.